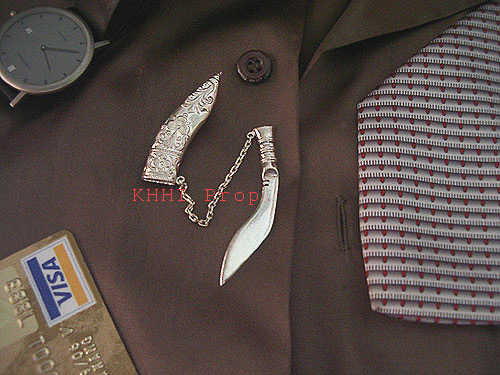 An ideal historic piece to decorate your tie and to enhance your personality at the same time..
Silver Tiepin is the concept of making the kukri wearable. 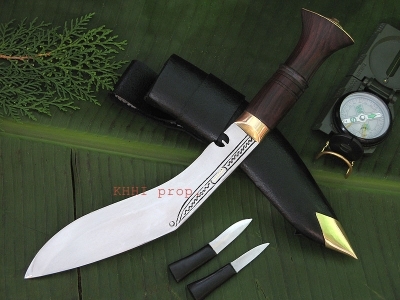 Since the khukuri is a potential ornament item one could smartly wear it on a tie with pride and prestige. It is a complete kukri-identical handmade adornment crafted from pure silver. The scabbard has artistic patterns on top and bonded to its khukuri by a silver chain. The blade is the replica of the “World War” Gurkha kukri version but made in a very small wearable size. The artisan uses only conventional tools, his bare hands and entirely depends on his expertise and experience to achieve the best quality possible. An ideal historic piece to decorate your tie and to enhance your personality at the same time.